From the ‘X-Files’ Dept: The Comet Elenin –A Threat or More ‘End-of-World’ Hype? Is Earth threatened by the Comet Elenin, a faint long-period comet discovered in December 2010. Long-period comets are chunks of ice and rock left over from the early days of the solar system, moving around the Sun in orbits that take more than 200 years to come around again. 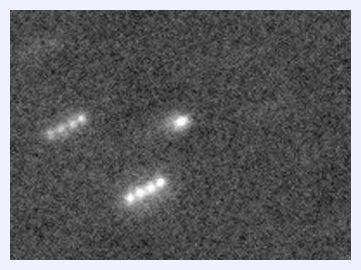 Comet Elenin (also known by its astronomical name C/2010 X1), was first detected on Dec. 10, 2010 by Leonid Elenin, an observer in Lyubertsy, Russia, who found the comet while using the remote-controlled ISON-NM observatory near Mayhill, New Mexico. At the time of its discovery, the comet was about 401 million miles (647 million kilometers) from Earth. Over the past 4 1/2 months, the comet has closed the distance to Earth's vicinity as it makes its way to perihelion its closest point to the sun. On Internet conspiracy sites, the comet is being blamed for the March 10 Japan earthquake and tsunami, and it is supposed to either hit the Earth or knock us off our axis in October. Some of the extreme theories suggest it is not a comet at all but a black hole or a smokescreen cover for an approaching brown dwarf that has a larger mass than Jupiter with multiple orbiting moons. 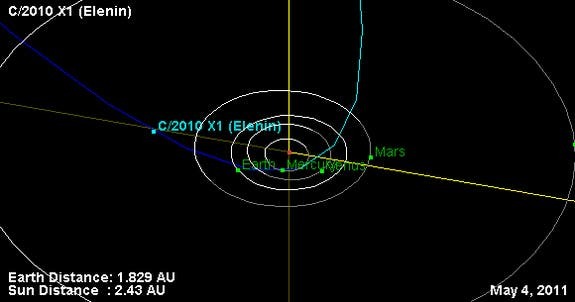 Elenin seems to be generating the first big comet scare since Hale-Bopp, last seen in 1997. A mistaken observation by an amateur astronomer led to the widely publicized rumor that some sort of alien spacecraft was following HaleBopp. A tragic consequence of the Hale-Bopp spaceship claim was the mass suicide by members of the Heaven’s Gate cult.